Pharmacology Division, A. U. College of Pharmaceutical Sciences, Andhra University, Visakhapatnam - 530002, Andhra Pradesh, India. ABSTRACT: The present study is designed to evaluate the in vitro antioxidant and in-vivo anti-inflammatory activities of Polyalthia longifolia (Sonn.) Thwaite seeds. Initially, the extracts (Nonpolar to polar) were screened for in-vitro antioxidant activity by DPPH, nitric oxide radical, hydroxyl radical, and superoxide radical considering ascorbic acid as standard. Among the extracts the ethyl acetate and methanolic extracts showed greater antioxidant activity further, the antioxidant activity of the extracts is supported by evaluating the total phenol content (114±1.7, 146.5±2.4 mg/g gallic acid equivalents respectively) and flavonoid content (2.86±0.10, 6.2±0.12 mg/g rutin equivalents respectively). Based on the initial study, the ethyl acetate and methanol extracts were evaluated for acute anti-inflammatory activity against the egg albumin (1%) induced inflammation. The selected extracts (200, 400 mg/kg) were administered 1 hour prior to the induction of inflammation. The anti-inflammatory activity is measured as a decrease in paw edema, measured at regular intervals (0.5, 1, 2, 3, 4, 5 h) of time, taking diclofenac (5 mg/kg) as a standard drug. Both the extracts showed significant dose-dependent anti-inflammatory activity when compared with the control. The 400 mg/kg dose of methanol extract showed greater percentage of inhibition (58.46%) when compared with the diclofenac (56.92%). The anti-inflammatory activity of the extracts is attributed due to the presence of active constituents like phenols, flavonoids, terpenes, steroids, etc. Hence Polyalthia longifolia seeds can be used in developing the lead molecules for the treatment of various chronic diseases like cancer, which are associated with the generation of ROS and inflammation. INTRODUCTION: Earth crust is the motherland for lakhs of varieties of medicinal and useful plants. India is the richest country blessed with a variety of genera of medicinal plants. Since ancient times herbal medicines are being used in the treatment of various diseases. Oxidation is the major step of metabolism for production of energy in all living organisms 1. During the process of oxidation various free radicals and reactive oxygen species (ROS) are produced at physiological conditions involved in various metabolisms 2. The abnormal generation of ROS plays a major role in the pathophysiology of various chronic diseases like cancer, athero-sclerosis, diabetes, alzheimer’s, arthritis etc. 3. During inflammation, the production of ROS further increases, as an immune response the antioxidant systems are activated to maintain 4. The chronic inflammatory conditions lead to an imbalance between the antioxidant systems and ROS generation, which ultimately results in oxidative stress 5. Hence the antioxidant capacity is correlated with anti-inflammatory activity. The currently available synthetic antioxidants are being used in the treatment of various oxidative stress induced diseases, are reported to produce some serious complications 6. Hence nowadays the research has been shifted towards the natural resources with potent antioxidant properties which correlate to depletion of oxidative stress. Polyalthia longifolia (Sonn.) Thwaites (PL) is an evergreen tall plant belonging to Annonaceae family, widely distributed in tropical and sub-tropical regions mainly India and Sri Lanka 7. It is commonly known as Ashoka or False Ashoka 8. Since ancient times Polyalthia has been used as anti-rheumatic, antipyretic 9. Previous studies have reported that the leaves and bark have antimicrobial 10, cytotoxic 11, antihyperglycemic 12, hypotensive 13, hepatoprotective 14 and anti-ulcer 15 activities. The major constituents of Polyalthia are diterpenoids and alkaloids 16. Besides, also contains phenols, flavonoids, and steroids 17. As per our knowledge, the pharmacological usage of P. longifolia seeds was not exploded hence, the present study was aimed to evaluate the In vitro antioxidant and In vivo anti-inflammatory activity of different solvent extracts of Polyalthia longifolia seeds. Chemicals: DPPH, nitro blue tetrazolium (NBT), ascorbic acid, rutin, gallic acid, Folin-Ciocalteu reagent, phenazine methosulfate (PMS), sulfanilic acid and egg albumin were purchased from Sigma Aldrich Co., (St. Louis, USA). All other chemicals used in the study were of analytical grade and were obtained commercially. Plant Extract: Polyalthia longifolia (Sonn.) Thwaites seeds were collected in the month of August 2015 from Tirumala hills of Chittoor district, Andhra Pradesh, India. The plant material was authenticated by Dr. Ramchandar Setty of botany department, Sri Venkateswara University, Tirupathi, Chittoor. The specimen was deposited in the herbarium of Sri Venkateswara University, Tirupathi bearing a voucher specimen number 782. The collected seeds were shade dried and ground into coarse powder. The powder (1000 g) was extracted with different solvents based on the polarity (Hexane: Ethylacetate: Methanol) by hot continuous percolation technique using Soxhlet apparatus for 48 h. The crude extract was concentrated under reduced pressure using Rotavapor (Buchi R-210 Rotavapor). The obtained dried extract was stored in an airtight container for further usage. Test Animals: Male Wistar albino rats weighing between 180-200g were obtained from NIN, Hyderabad, India. The animals were grouped and maintained under standard laboratory conditions of 25 ± 2 ºC temperature and 12:12 light/ dark cycle. Rats were fed with standard pellet diet and water ad libitum. All the animals were acclimatized under laboratory condition for one week prior to the commencement of the experiment. The experimental procedure was carried out in accordance with the CPCSEA guidelines. The experimental protocol was approved by the institutional animal ethics committee (IAEC) bearing the registered no. 516/PO/c/01/ IAEC. 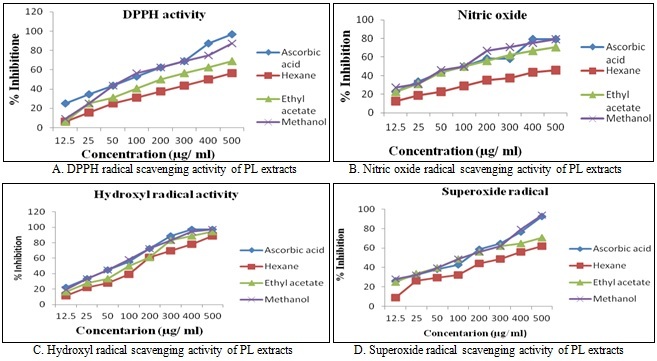 Determination of In-vitro Antioxidant Activity: The antioxidant activity of PL different extracts was screened by using DPPH radical, nitric oxide, hydroxyl radical and superoxide radical scavenging activity. Further, the total phenol and flavonoid contents were also estimated. Phenol and Flavonoid Contents: The phenolic content of the extract was evaluated by using Folin- Ciocalteau reagent as the method described by Kandhasamy, 2013 22. The total phenolic content of the extract is expressed as gallic acid equivalents. The flavonoid content of the extract was evaluated by the method described by Md. Mahbubar et al., 2015. The total flavonoid content the extract is expressed as Rutin equivalents 23. Acute Toxicity Studies: The acute toxicity study was conducted according to the OECD (420) guidelines by fixed dose method. In the study, the different extracts were administered to groups of 5 males and 5 female animals at one of the fixed doses of 2000 mg/Kg and observed for behavioral changes and signs of toxicity continuously for 24 h. Further, the observation was continued for 14 days. Based on the studies the 2000 mg/kg is considered as the safest dose and in the present study the 1/5th and 1/10th doses were considered. Test Compound Preparation: The plant extracts of P. longifolia was weighed and made into suspension with gum acacia (2%) and Tween-80 (0.1%). In vivo Anti-Inflammatory Activity: Based on In vitro studies the order of antioxidant activity of extracts is hexane< ethyl acetate < methanol. Hence for In vivo studies we have considered only ethyl acetate (EAPLS) and methanolic extracts (MPLS). The anti-inflammatory activity of Polyalthia longifolia seeds was carried out by using egg albumin as an inflammatory agent. Group 3: Standard - The rats were administered with diclofenac (5 mg/kg), 1h prior to induction of inflammation. Group 4: The rats were administered with EAPLS extract (200 mg/kg), 1h prior to induction of inflammation. Group 5: The rats were administered with EAPLS extract (400 mg/kg), 1h prior to induction of inflammation. Group 6: The rats were administered with MPLS extract (200 mg/kg), 1h prior to induction of inflammation. Group 7: The rats were administered with MPLS extract (400 mg/kg), 1h prior to induction of inflammation. Statistical Analysis: All the values were expressed as Mean ± S.E.M. The results were analyzed by one- way ANOVA followed by post-test (Turkey’s test) where p*< 0.05 and p**< 0.001 were considered as statistically significant. All the statistical analysis was performed by using graph Prism software, (Version 5.0 (San Diego, CA, USA). Antioxidant Activity: The antioxidant activity of PL seed extracts (Hexane; Ethyl acetate; Methanol) was evaluated by free radical scavenging activity of DPPH, nitric oxide, hydroxyl radical and Superoxide radical. The PL seeds exhibited a considerable antioxidant activity when compared with the standard ascorbic acid. 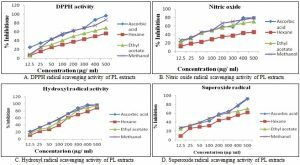 The ethyl acetate and methanolic extracts exhibited marked antioxidant activity when compared with hexane extract Fig. 1. The antioxidant activity of ethyl acetate and methanol were further supported by total phenol and flavonoid contents of the extracts. The phenolic content of ethyl acetate and methanolic extracts were 114±1.7 and 146.5±2.4 mg/g gallic acid equivalents respectively, whereas the flavonoids contents are 2.86±0.10 and 6.2±0.12 mg/g rutin equivalents respectively. In-vivo anti- inflammatory Activity: The EAPLS and MPLS extracts showed a significant dose-dependent anti-inflammatory activity by decreasing the paw edema when compared with the positive control. The MPLS showed a significant (P<0.0001) reduction in edema and the activity is comparable with the standard drug diclofenac. The results were given in Table 1. All the values are expressed as Mean ± SEM (n=6). The P*<0.05 is considered as statistically significant when compared with control. The P#<0.05 is considered as statistically significant when compared with normal. The values in parentheses indicate the percentage (%) of inhibition of paw edema. DISCUSSION: Oxidative stress is the cardinal mechanism involved in the pathogenesis of various chronic diseases which results in the imbalance between the generation of reactive oxygen species and antioxidants 25. The DPPH radical is a stable free radical which ready accepts electron and converts into stable diphenylpicrylhydrazine. The degree of conversion is indicated with the decrease in the absorbance. A good antioxidant property is to readily donate hydrogen ions; hence DPPH radical scavenging activity is a better method for screening the antioxidant properties 26. Nitric oxide (NO) is a biodegradable molecule generated both in physiological and pathological conditions. The NO reacts with oxygen and results in the formation of various reactive nitrates and nitrites which results in detrimental effects. During inflammatory conditions the production of NO increases; hence there is a direct link between the nitric oxide scavenging activity and anti-inflammatory activity of the extracts 27. Hydroxyl radical is the powerful reactive species formed from superoxide radical, hydrogen peroxide and other reactive species by Haber-Weiss reaction indicating the signs of oxidative stress 2. The hydroxyl radicals play a vital role in lipid peroxidation and cellular membrane deformations result in defective cellular mechanisms 22. The polyphenols present in the extracts attributes to the hydroxyl radical scavenging activity. The scavenging activity is positively correlated with the concentration of the extract. The superoxide radical (O2-) is the most important reactive species formed during cellular metabolism in living species. The superoxide radical is the precursor for the formation of hydrogen peroxide (H2O2) which is involved in protein denaturation, DNA/RNA damage, lipid peroxidation, and leads to the oxidative stress which results in cellular damage 28. The hydrogen peroxide (H2O2) is converted into water (H2O) by endogenous antioxidant enzyme superoxide dismutase (SOD) 29; hence the in-vitro superoxide scavenging activity is correlated to in-vivo SOD activity of the extract. The scavenging activity is indicated by the formation of formazone. The polyphenols and flavonoids are primary antioxidants which exhibits a broad spectrum of pharmacological activities. The PL posses a good free radical scavenging activity, which is attributed to the phytochemical constituents like phenols and flavonoids present in the extracts. Hence, the antioxidant activity is correlated to the phenol and flavonoid contents of the extracts 5. Inflammation is the peripheral mechanism involved with the release of various inflammatory mediators like bradykinins, prostaglandins, histamine, and serotonin 30. In various studies, the egg albumin is used as a phlogistic agent for screening the anti-inflammatory drugs. The results clearly showed that the subplantar injection of egg albumin exhibited peak activity for one hour (1 h). The inflammatory activity of egg albumin is associated with the release of histamine and serotonin 24, 31. The present study showed that the P. longifolia seeds exhibit significant dose- dependent anti-inflammatory activity by inhibiting the acute inflammatory mediators released by egg albumin. The anti-inflammatory activity of the extracts is attributed due to the presence of active constituents like phenols, flavonoids, terpenes, steroids etc. 32. CONCLUSION: The results conclude, that the Polyalthia longifolia seeds can be a potential source for antioxidant and anti-inflammatory active constituents which can be used in the treatment of various chronic diseases associated with the generation of ROS and inflammation like cancer, diabetes etc. Hence P. longifolia seeds can be used in developing the lead molecules for the treatment of various diseases. ACKNOWLEDGEMENT: I sincerely thank Department of Science and Technology (DST) for funding the project with the grant number (DST/DISHA/SoRF-PM/032/2015/01/G) and Andhra University for bestowing me with the entire necessary infrastructure for completion of my research work and I convey highest regards to my research guide for her constant countenance to my research. 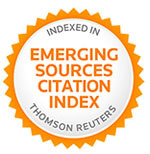 CONFLICT OF INTEREST: The authors have declared that we have no conflict of interest. Shettar AK, Kotresha K, Kaliwal BB and Vedamurthy AB: Evaluation of in vitro antioxidant and anti-inflammatory activities of Ximenia Americana. Asian Pac J Trop Dis 2015; 5: 918-923. Jothy SL, Aziz A, Chen Y and Sasidharan S: Antioxidant activity and hepatoprotective potential of Polyalthia longifolia and Cassia spectabilis Leaves against Paracetamol-Induced Liver Injury. Evidence-Based Complementary and Alternative Medicine 2012; 1-10. Yamada K, Hung P, Park TK, Park PJ and Lim BO: A comparison of the immunostimulatory effects of the medicinal herbs Echinacea, Ashwagandha and Brahmi. J Ethnopharmacol 2011; 137: 231-235. Kumaran A and Karunakaran RJ: In-vitro antioxidant activities of methanol extracts of five Phyllanthus species from India. LWT 2007; 40: 344-352. Shukla S, Mehta A, Bajpai VK and Shukla S: In-vitro antioxidant activity and total phenolic content of ethanolic leaf extract of Stevia rebaudiana Food and Chemical Toxicology 2009; 47: 2338-2343. Katkar KV, Suthar AC and Chauhan VS: The chemistry, pharmacologic, and therapeutic applications of Polyalthia longifolia. Pharmacogn Rev 2010; 4: 62-68. Annan K, Dickson RA, Sarpong K, Asare C, Amponsah K, and Woode E: Antipyretic activity of Polyalthia longifolia & Hook. F. var. pendula (Annonaceae), on lipopolysaccharide-induced fever in rats. Journal of Medical and Biomedical Sciences 2013; 2: 8-12. Murthy MM, Subramanyama M, Bindu MH and Annapurna J: Antimicrobial activity of clerodane diterpenoids from Polyalthia longifolia Fitoterapia 2005; 76: 336-339. Manjula SN, Kenganora M, Parihar VK, Kumar S, Nayak PG and Kumar N: Antitumor and antioxidant activity of Polyalthia longifolia stem bark ethanol extract. Pharm Biol 2010; 48: 690-696. Nair R, Shukla V and Chanda S: Assessment of Polyalthia longifolia pendula for hypoglycemic and antihyperglycemic activity. Journal of Clinical and Diagnostic Research 2007; 1: 116-121. Saleem R, Ahmed M, Ahmed SI, Azeem M, Khan RA and Rasool N: Hypotensive activity and toxicology of constituents from root bark of Polyalthia longifolia pendula. Phytother Res 2005; 19: 881-884. Tanna A, Nair R and Chanda S: Assessment of anti-inflammatory and hepatoprotective potency of Polyalthia longifolia pendula leaf in Wistar albino rats. J Nat Med 2009; 63: 80-85. Malairajan P, Gopalkrishnan G, Narasimhan S, Veni K: Evalution of anti-ulcer activity of Polyalthia longifolia (Sonn.) Thwaites in experimental animals. Indian Journal of Pharmacology 2008; 40: 126-128. Wu YC, Duth CY, Wang SK, Chen KS and Yang TH: Two new natural azofluorene alkaloids and cytotoxic aporphine alkaloids from longifolia. Journal of Natural Products 1990; 5: 1327-1331. Dosh GM, Zine SP, Chaskar PK, Une HD: Solicitation of HPLC and HPTLC Techniques for determination of rutin from longifolia Thwaites. Pharmacognosy Res 2014; 6: 234-239. Adebiyi OE, Olayemi FO, Ning-Hua T and Guang-Zhi Z: In-vitro antioxidant activity, total phenolic and flavonoid contents of ethanol extract of stem and leaf of Grewia carpinifolia. Beni-Suef University Journal of Basic and Applied Sciences 2017; 6: 10–14. Paliwal SK, Sati S, Faujdar S and Sharma S: Antioxidant and antibacterial activities of various extracts of Inula cuspidateB. Clarke stem. Beni-Suef University Journal of Basic and Applied Sciences 2017; 6: 97-105. Singh N and Rajini PS: Free radical scavenging activity of an aqueous extract of potato peel. Food Chemistry 2004; 85: 611-616. Alam MN, Bristi NJ, Rafiquzzaman M: Review on in vivo and in vitro methods evaluation of antioxidant activity. 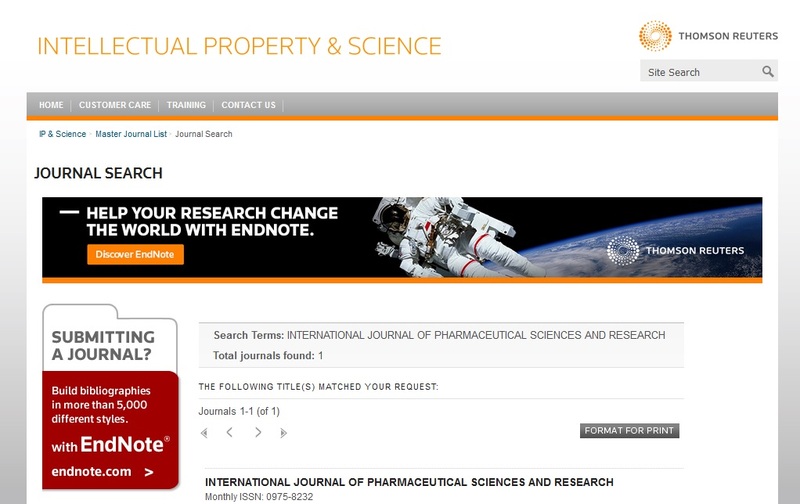 Saudi Pharmaceutical Journal 2013; 21: 143-152. Sowndhararajan K and Kangnt SC: Free radical scavenging activity from different extracts of leaves of Bauhinia vahlii Wight and Arn. Saudi J Biol Sci 2013; 20: 319-325. Rahman MM, Biswas MBIM and Alam AHMK: -itro antioxidant and free radical scavenging activity of different parts of Tabebuia pallid growing in Bangladesh. BMC Res Notes 2015; 8: 621. Akindele AJ and Adeyemi OO: Anti-inflammatory activity of the aqueous leaf extract of Byrsocarpus coccineus. Fitoterapia 2007; 78: 25–28. Karagoz A, Artun FT, Ozcan G, Melikoglu G, Anil S, Kulturd S and Sutlupinaritro N: In-vitro evaluation of antioxidant activity of some plant methanol extracts. Biotechnology and Biotechnological Equipment 2015; 29: 1184-1189. Habu JB and Ibeh BO: In-vitro antioxidant capacity and free radical scavenging evaluation of active metabolite constituents of Newbouldia laevis ethanolic leaf extract. Biol Res 2015; 48: 16. Rao BG, Kiran PM and Raju AV: Investigation of antioxidant and anti-inflammatory activity of leaves of Dalbergia paniculata (Roxb). Asian Pac J Trop Med 2012; 455-458. Lu JM, Lin PH, Yao Q and Chen CJ: Chemical and molecular mechanisms of antioxidants: experimental approaches and model systems. Cell. Mol. Med 2010; 14: 840-860. Adams CD, Okoli CO, Akah PA, Nwafor SV, Anisiobi AI, Ibegbunam IN: Anti-inflammatory activity of hexane leaf extract of Aspilia africana. J Ethnopharmacol 2007; 109: 219-225. Okokon JE, Udoh AE, Frank SG and Amazu LU: Anti-inflammatory and analgesic activities of Melanthera scandens. Asian Pac J Trop Biomed 2012; 2: 144-148. Thonangi CV and Akula A: In vitro antioxidant and anti-inflammatory activity of Polyalthia longifolia (Sonn.) Thwaite seeds. Int J Pharm Sci & Res 2018; 9(9): 3774-80. doi: 10.13040/IJPSR.0975-8232.9(9).3774-80.